I grew up with a single mom. My mom made all the decisions for my sister and I. Even when she remarried when I was 15 she still made all the decisions for my sister and I: my stepfather did not play a parental role. Now I'm having a baby and I have a husband. I'm not a single mother. But all I've seen in parenting styles is single style parenting because I grew up that way. While I experienced a closeness with my mom that I'll value forever and I loved growing up with her, I will admit that I am used to seeing one parental figure make all the decisions with little input from a spouse or partner. I have been blessed by this in many ways--but of course like all styles of parenting there are things I need to learn. And things I might not realize I need to learn, but that I still, regardless of my particular feelings on the matter, need to learn. I was a bit confused when, after my second baby appointment my husband expressed interest in attending the next prenatal exam with me. I thought he was just being nice. I mean, I've never heard a man discuss pregnancy in any sort of positive light before. And I've never ever heard of men attending their wives doctor visits. I couldn't imagine why he would want to go with me. Wouldn't he be bored?What could he possibly do? Later he expressed that he'd like to go to my doula appointments as well. I got a bit upset with him at this point. Couldn't he trust me? Didn't he think I could make good decisions for our baby? Why was he trying to intrude on what I vehemently thought of as my time? Plus, I said, the baby is in my belly. It is mostly my baby right now. It didn't occur to me that he could make any positive contributions at the moment. Everything I was learning related to me and my body, to birth and prenatal health: things my husband by nature of his otherness to myself could not affect. I felt like he was encroaching on what I thought of a "my" time with the baby, my bubble of learning and growing, a special time that was not related to men in any sort of fashion. 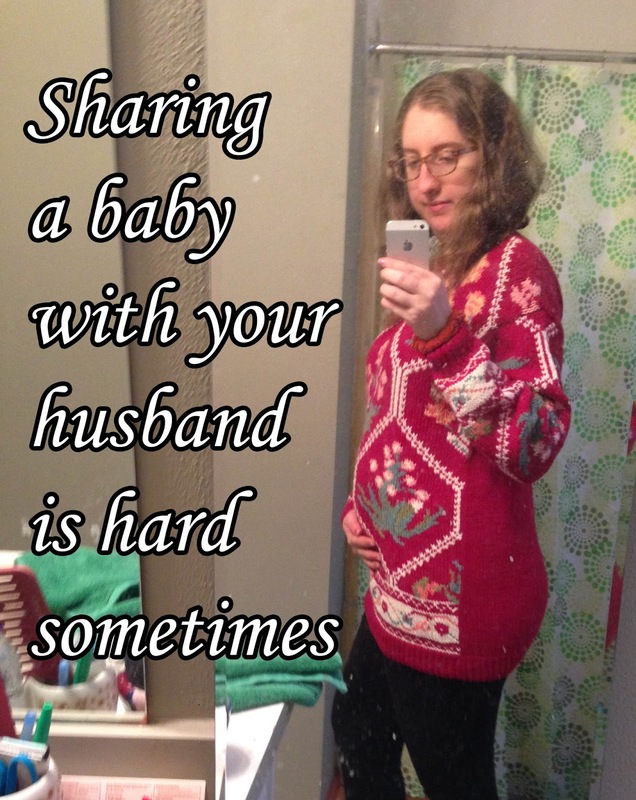 I don't know if other women feel this way, but to me the baby feels like my baby. I don't quite understand it. It's inside me. It relies totally on me right now. It just feels like mine, and the fact that my husband wanted to "help make decisions" ruffled my feathers for some unknown reason. Once I realized how I was feeling and that my feelings didn't make any sense, I was able to talk more openly with my husband without getting mad. I don't know if I felt this way because I had a single mother or because I've never heard of a man being interested in appointments and birth or just because of my selfish-I-can-do-it-alone nature, but I had to realize that I was happily married and my husband and I did make this baby together. And thus, even if it still seems rather foreign to me, it is not weird that he wants to be a part of this life with me. It just feels weird to me even through I don't know why. I'm still mulling over it in my head. Why do I feel this way? What is it that makes me feel this way?